Last time I blogged I was in the midst of sorting out fraud on Cinnamon’s PayPal account, my younger daughter had just had an accident, I’d misplaced a batch of train tickets and, just before Easter, it was snowing in Tanygrisiau. Nonetheless it was spring and, of course, all of these things have passed, just as the winter has passed – yes, it’s still cold and raining here, but it’s slightly warmer rain and… hope springs… but from where does it spring? A couple of people from my past have recently been in my thoughts. A long time ago Rowan Williams was my Christology supervisor at university and later my referee when I began my PhD in Feminist Christology. My own journey through the church has made me wary of institutions and of the ability of good people to survive them well, though I know many valiant people attempting just that and sometimes having very positive impacts on the lives they touch. Rowan Williams has announced he is retiring as Archbishop of Canterbury at the end of the year and I can’t help feeling that academia is a better element for someone of such intelligence and integrity, though it will no doubt have its own share of institutional demons to contend. 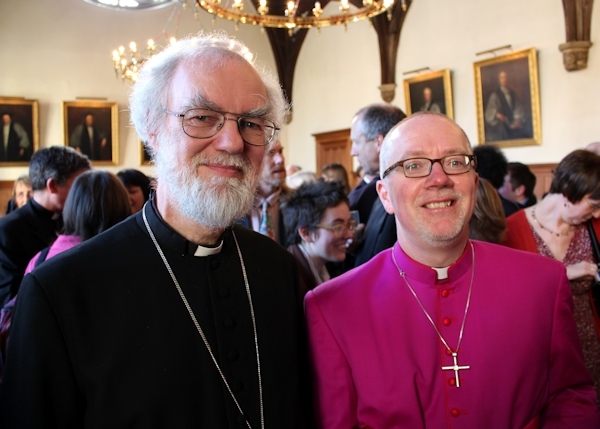 Before he goes, he will go about the business of ‘archbishoping’ for a few more months and in that capacity Rowan Williams recently consecrated a very good friend of mine from theological college days; my older son’s godfather, Jonathan Clark, as Bishop of Croydon. Reading the interviews with local media there is a lot of excitement about taking up the role, about issues of social justice and inclusiveness, about how faith and contemporary culture interact. For many of my friends, faith is the locus of hope for the world, but faith is also something that many others don’t relate to at all and for me it’s another country, one that I know I once lived in, but now have a high level of amnesia about. But I am not without hope. A couple of weekends ago I was at Much Wenlock Poetry festival. It’s a fantastic festival in a gorgeous little Shropshire town, fantastically well-organised by Anna Dreda of Much Wenlock Bookshop and her team of ever-helpful volunteers. I heard Jackie Kay reading – sharing a passion for friends and family that was infectious; I listened intently to Martin Figura’s stunning performance of his one-man show based on his collection, Whistle, and laughed and cried and felt the deeply humane sense of hope and resilience in his work; I was spellbound by Mario Petrucci, who I was at university with and hadn’t seen since (though we’d emailed over the years), as he read linguistically intense poems on war, ecology, the land, love. When Anna introduced the Cinnamon Press poets to the audience she talked about the vitality of poetry – the essentialness of small presses and small press poets to a world that needs humanity, narrative, hope.